The underlying assumption is that the record of Hillary Clinton indicates that her campaign rhetoric reflects accurately both her real beliefs and the policies that she has instituted in her political career. This is a false assumption. According to Clinton’s supporters, her verbal endorsement of liberal social positions makes her a progressive regardless of whether she has an actual record of supporting Wall Street and the billionaire class, who,as I documented in a previous report, constitute and have constituted the top financial contributors to her political career. In fact, the assumption of these supposedly liberal pundits is that corruption (back-door political payoffs to financial backers) isn’t a far more important issue in American politics and policymaking than is mere verbal adherence (such as Hillary is now giving) to social issues such as feminism and gay rights. However, those ‘journalists’ aren’t even accurately representing Hillary Clinton’s merely verbal record, much less her actual policy record. On 12 June 2014, Ms. Clinton on NPR said, “For me, marriage had always been a problem left for the states.” In other words: it wasn’t a human right, available to people in a manner without prejudice; it was like slavery before President Lincoln: a state’s-rights matter instead of a human-rights matter. “Of course. And, you know, again, let’s — we are living at a time when this extraordinary change is occurring and I’m proud of our country.” In other words: She follows, instead of leads, the country, on even that issue. “But not — to be fair, Terry, not that many.” In other words: She follows instead of leads the country — even in her mere rhetoric, not to even deal with what her actual policies are and have been. However, her policies have been consistently to serve the rich and powerful (her financial backers) at the expense of the poor and powerless. This fact was amply documented in the links to my most recent article on her actual record. 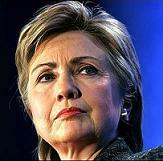 She ardently supported NAFTA but then criticized it when she was running in 2008 for the Presidency. And on Fracking, GMOs and other issues where large international corporations have profit-interests that go in the opposite direction to the public interest, she has reliably been with the mega-corporations. In American journalism, standing up against a serial liar who has support from much of the Establishment can get one fired, or one’s show cancelled. Gross responded: “OK, thank you for clarifying that. [Now addressing her listeners:] If you’re just joining us, my guest is Hillary Clinton. Her new memoir ‘Hard Choices’ is about her four years as secretary of state.” The ‘journalist’ thus got back to what she’s paid for: selling what the Establishment is offering — in this case: selling another Republican ‘Democrat’ like Obama has been. This way, for example, the Wall Street bailouts and resultant soaring federal debt that will have to be repaid by higher taxes and/or less government services to all future U.S. taxpayers and that were started by George W. Bush and were continued by Barack Obama, will be continued without doubt if Hillary Clinton becomes the Democratic Party’s Presidential nominee: she’ll adhere to Republican policies as much as Obama has adhered to Romney’s policies on most things. And that’s really what ‘journalists’ such as at Guardian and NPR are really selling. Their real audience isn’t the public who think they are receiving journalism instead of mere propaganda; it’s instead the aristocracy who control the ‘news’ media.